Callum Mansfield working with the hundreds of ensemble members. Photo by Nick Morrissey Photography. Harvest Rain Theatre Company kicks off its national tour of Grease – The Arena Experience in Brisbane April 7-9, featuring Eurovision superstar Dami Im. 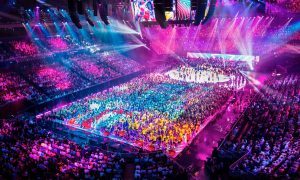 For over 30 years, Harvest Rain has produced theatre and nurtured up-and-coming Australian talent with a focus on helping creative young people reach for the stars and achieve their dreams while also creating stunning entertainment experiences for Australian audiences. 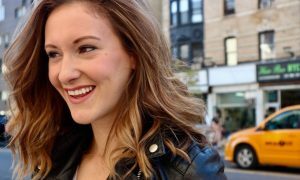 Since 2014, the company has turned to creating and touring large-scale arena productions of well-known musicals to give the opportunity to thousands of young performers to perform with artists they may consider as idols. 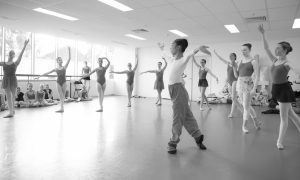 “Our production of Grease will be an arena experience starring the likes of Dami Im, Jemma Rix and some other really incredible upcoming performers like Drew Weston, Megan O’Shae and Lauren McKenna,” says Callum Mansfield, the choreographer of Grease – The Arena Experience and Harvest Rain alumni. 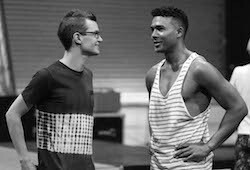 Callum Mansfield giving direction to Barry Conrad (Kenickie) in rehearsals. Photo by Nick Morrissey Photography. As a young performer in the original Boy from Oz, Mansfield joined Harvest Rain to satisfy his inner theatre bug. He jokes that in the beginning he spent much time as “the third tree from the left in show after show” but soon started challenging himself by learning everyone else’s choreography, which eventually turned into a new role. Mansfield describes his life since then as being “hashtag blessed” by working on national touring productions including The King and I and Dirty Dancing but acknowledges his two most important roles as being a husband and father to two sons. 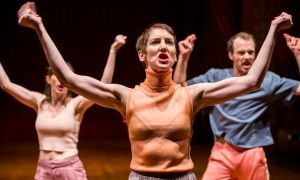 “Balancing the touring life and family life is not simple, so when the opportunity arose to work with Harvest Rain again on developing the arena productions back in my home town, I jumped on board,” he says. He continues, “I’m also looking forward to the ‘High School Hop’ scene that opens Act 2. With hundreds of teenagers and a stage that is bigger than a school gymnasium, we can re-create a real school dance! Can you imagine an entire school doing ‘Born to Hand Jive’ live in front of you? These are the kinds of fun things the arena gives us the freedom to explore. 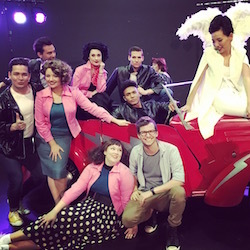 Dami Im, Callum Mansfield and the cast of ‘Grease’. Photo by Nick Morrissey Photography. 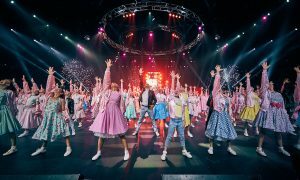 To see when Grease –The Arena Experience is auditioning in your state, show dates and ticketing information, visit www.greasearenashow.com or www.harvestrain.com.au.